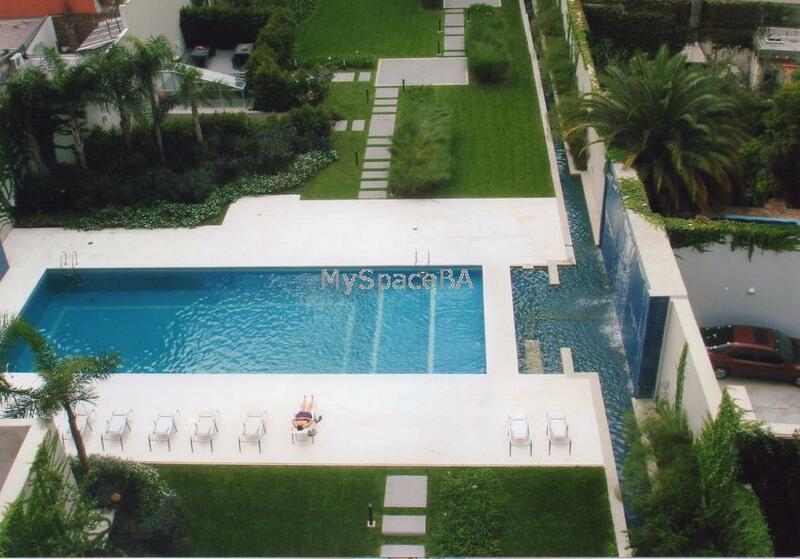 Beautiful and very bright one bedroom apartment located in Palermo Soho in a brand new high rise building with great amenities such as a large swimming pool , green garden, gimnasium. The apartment has a living area with a comfortable sofa , LCD TV , dinning area with table and chairs . Open plan and fully equipped kitchen . One bedroom en suite with queen size bed . Full bathroom . Balcony with view to the building´s garden and pool. Hardwood floor . LCD TV with cable . Internet High Speed . Wi Fi . Aircon . Heater . Landline telephone for local calls . Kitchen with microwave , toaster , coffe-machine . Dishes . Kitchen utensils . Brand new high rise building . Elevators . Doorman 24hs . Swimming pool for summer season . Gimnasium . BBQ area . Home theather area . Laundry . Playground . 2300m2 green garden . In the heart of the Soho . Plaza Serrano or Cortazar. Design shops , restaurants, bars , pubs , flea markets , laundry , bus stops , cybers , parking areas . Nightlife area and commercial area . Just 8 blocks from the city zoo, Botanic garden . Banks . Exchange House . etc. Included: Electricity bill , gas , water , internet , telephone for local calls, building and city taxes .